Today the Collab Lab hosted Spark Sessions and Learning Labs for all staff during an extended late start Thursday morning. 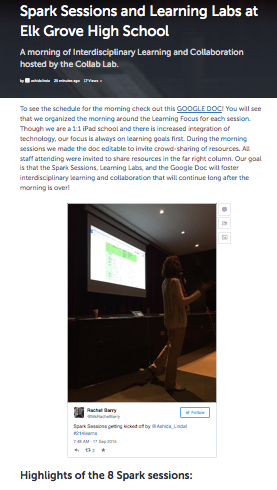 It was a great morning of professional learning and interdisciplinary collaboration with 8 Spark Sessions (~five minutes each) followed by 2 informal Learning Labs (twenty-five minutes each). We shared the schedule with staff via this Google Doc. Our goal for the morning was to spark learning that would continue long after the day was over. To faciliate future learning, we decided to make the doc editable during the morning and we invited all staff attending to add resources in the far right column of the document. Feedback from the morning has been very positive. 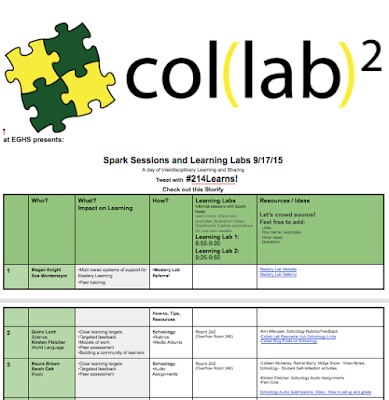 Staff indicated that they enjoyed the variety of the spark sessions and opportunity to learn and explore new ideas with colleagues from so many different departments in the Learning Labs. Also, many noted how the Learning Lab sessions demonstrated the rich interdisciplinary culture of learning at Elk Grove High School that continues to grow. A Spanish teacher commented how she enjoyed collaborating with a Science teacher and two music teachers to experimenting with audio assignments in Schoology! To get a better idea of what our day looked like and sounded like, check out highlights from Twitter curated in this Storify.